Steve Jobs is the third film about the Apple co-founder in as many years, and none of them has managed to set the box office alight. It seems not that many people are interested in the life of the man who created the world's most valuable company. But the latest attempt, from director Danny Boyle, has garnered rave reviews from critics, and with good reason: it's a great movie. Aaron Sorkin, writer of The West Wing and The Social Network, took on the task of writing Steve Jobs back in 2012. It seemed like a match made in heaven, with the scribe having already adapted the Facebook story. Sorkin is well known for writing smart, witty dialogue for highly intelligent characters, making him a perfect fit for the job of writing about Jobs and the people he surrounded himself with throughout his time at Apple. "I came up with this notion of doing the entire movie in three real-time scenes," Sorkin explains. "I wanted to take these moments of friction in Steve's life and dramatise them by creating confrontations. Obviously Steve didn't have confrontations with the same five people 40 minutes before a product launch three times over." 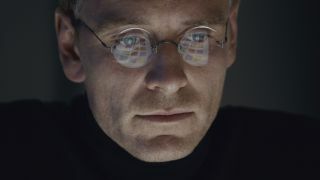 Steve Jobs isn't a biography – Sorkin has made that clear. Instead, it takes a few key moments from the man's life, each surrounding key products launched by Jobs – but Sorkin didn't just choose his favourite Apple branded devices. "I've heard people say 'Oh my god, how could you not do the iPhone? '," Sorkin says. "That's not the point of this movie. That's the other movie they're talking about, the one where we land on all the greatest hits. "I chose the first one, in 1984, because Steve was still denying paternity of Lisa. There were other bonuses in there as well." "The Macintosh was the first product that Steve really felt complete ownership of. He got to make it his way, no slots. End to end control. He got everything he wanted and then it failed." It's not just all about the hits - the iPod only gets a fleeting mention, while the iPad is nowhere to be seen (aside from a little hint towards an app-filled future) and there's a lot more about the negatives of Jobs' career. The second key scene features Steve's own pet project, when he left Apple to set up his own company. "The NeXT Computer is the king is in exile. Then in act three the king returns," says Sorkin. That third act is when Jobs comes back to Apple to launch the first iMac in 1998. "If I had done the iPhone, it would have been [that] the king returned six years ago. I wanted to do the first launch after Steve came back." After The Social Network, Sorkin didn't go searching for another tech behemoth to write about; it just happened that way. "It was a blind date. Not literally, but metaphorically a blind date. In other words I hadn't always been interested in Steve Jobs or wanted to write about him. I had just done The Social Network, with the same group of people and then Moneyball. "They had just optioned Walter Isaacson's biography. And they came to me and said they want me to do this." The film is loosely based on the 2011 biography that was released only nineteen days after Jobs' death. Sorkin explains: "I was curious about the emotional connection people felt to his products." "I started meeting with Woz [Steve Wozniak], Joanna Hoffman, Andy Hertzfeld. I was very lucky John Sculley, that hasn't really spoken to anyone that much since he left Apple, was willing to speak to me. "I was even luckier that Lisa Brennan-Jobs – who had not spoken to Walter because her father was alive at the time – was willing to speak to me."